For other uses, see Forfar (disambiguation). 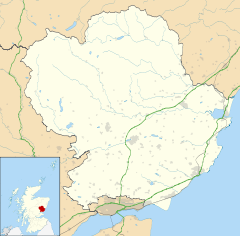 Forfar /ˈfɔːrfər/ ( listen) (Scots: Farfar, Scottish Gaelic: Baile Fharfair) is the county town of Angus, Scotland and the administrative centre for Angus Council. It has a population of 14,048. Forfar dates back to the temporary Roman occupation of the area, and was subsequently held by the Picts and the Kingdom of Scotland. It was occupied by the English before being recaptured by the Scots and presented to Robert the Bruce during the Scottish Wars of Independence. Forfar has been both a traditional market town and a major manufacturing centre for linen and jute. Today the main activities are agriculture and tourism around scenic Strathmore. The local glens are visited by hill-walkers, and there are ski-slopes in the mountains. The town has a League One football club, Forfar Athletic and a National League rugby team, the Strathmore Silverbacks. The Forfar bridie, a Scottish meat pastry snack, is traditionally identified with the town. During one of the Roman invasions of modern-day Scotland, the Romans established a major camp at Battledykes, approximately 3 miles (5 km) north of Forfar; this camp was analysed to have held 50,000 to 60,000 men. From Battledykes northward the Romans established a succession of camps including Stracathro, Raedykes and Normandykes. During the Middle Ages, a "claimant" to the throne, the daughter of the leader of the Meic Uilleim, who were descendants of King Duncan II, had her brains dashed out on Forfar market cross in 1230 while still an infant. During the First War of Scottish Independence, the castle of Forfar was held by the English. After Robert the Bruce's victory over the Earl of Buchan, Philip, the Forester of Platane, together with some of his friends raised ladders against the wall and, climbing over, surprised the garrison and slew them. He then yielded the castle to Bruce, who rewarded him and gave instructions for its demolition. The Meffan Museum is in the heart of the town. It was built by a daughter of the Provost Meffan as a bequest in 1898. It is home of the Forfar story. It is also an art gallery and a meeting place for local speakers, summer clubs for children and groups. The story of Forfar takes you from the history of the little cobbler shops to the burning of the witch Helen Guthrie. There is also a good selection of Pictish stones found in and around Forfar and Kirriemuir. The Large Class I Pictish stone, with a rare carving of a flower, is called the Dunnichen Stone. It was found in the early 19th century when a farmer from the East Mains of Dunnichen was ploughing. It was initially displayed at a church in the vicinity, then at Dunnichen House. In 1966 it was relocated at St Vigeans and finally moved to Dundee museum in 1972. After the Meffan Institute had been renovated it was brought to Forfar on a long term loan where it is displayed alongside the Kirriemuir Sculptured Stones. There is also a canoe, excavated from Forfar Loch, that dates back to the 11th century (one of two that were found). Like other parts of Angus, Forfar was home to a very successful textile industry during and after the Industrial Revolution. In the late 18th century the firm of William Don & Co. (later William and John Don & Co) was founded in the town. The firm originally bought and sold webs of linen which were woven in local cottages, although it also operated a small weaving shed. In 1865 the firm merged with A J Buist, a Dundee based firm, and began construction of St James Works in Forfar. The partnership also operated mills in Dundee and later built Station Works in Forfar, which contained some 300 looms. Workers housing was also built by the firm in Forfar. Don Brothers, Buist & Company Ltd, as the firm was known from 1904, built another works in Forfar, at Strang Street, in 1929. In 1960 it merged with another Dundee firm, Low Brothers & Co (Dundee) Ltd, eventually becoming Don & Low (Holdings) Ltd. By the 1980s the Don & Low group was the United Kingdom's biggest polypropylene textile extrusion and weaving unit. The firm retains premises in Forfar, mainly producing woven and non-woven polypropylene industrial textile products and plastic food packaging. In 1958 Don Brothers, Buist & Co Ltd acquired a controlling interest in another Forfar based-textile firm, Moffat & Son Ltd, who operated Haugh Works in South Street. Another important Forfar textile firm was J & A Craik & Company, Linen and Jute Manufacturers, which was based at the Manor Works. Craiks was started in 1863 when James Craik obtained land in Forfar to build the Manor Works and the company survived until 1981, the year in which it became part of the Low and Bonar group. Craiks also owned Forfar Fabrics Ltd, incorporated in 1965, which amalgamated with Low & Bonar Textiles Limited in 1981. The jute manufacturers, John Lowson, Jnr & Co Ltd, also operated in Forfar, operating out of Victoria Works. Memorial plaque to the Polish Army in Forfar. In 1911 more than 20% of workers in Forfar were employed in the jute industry. Employment levels in this industry generally dramatically declined in other parts of Angus, including Dundee, during the next four decades. Notably in Dundee, the centre of the British jute industry, more than 40.4% of the working population had worked in the jute industry in 1911, but by 1951 this had fallen to just 18.5%. In Forfar, however this trend was not followed as percentage of the workforce employed in the jute industry had actually risen to 24.4% by 1951. In the town there is a metal plaque to General Sikorski and the Polish troops commemorating the visit of King George VI and Queen Elizabeth to the town on 7 March 1941. The metal plaque is located on a wall on Market Street below the Sheriff Court building. It was here on 7 March 1941 that the Royal couple, along with General Sikorski, took the salute in the march past of the Polish troops. Forfar is a parish, town and former royal burgh. It is the county town of Angus, which was officially known as Forfarshire from the 18th century until 1929. The town is represented within Angus Council by the Forfar & District ward, from which four councillors are elected. The members elected from this ward are, as of 2012; Lynne Devine (Scottish National Party), Glennis Middleton (SNP), Colin Brown (Independent) and Ian McLaren (Independent). The town is located just off the main A90 Dundee to Aberdeen road which since 1987 has bypassed the town, but once passed through it. The town was served by Forfar railway station which ran goods and passenger lines until 3 September 1967 when it closed for passenger transport as part of the Beeching cuts. A goods line from Perth continued until 1982. The station was located on the main line of the Caledonian Railway from Glasgow Buchanan Street to Aberdeen, which was the furthest north link in the chain of the West Coast Main Line from London Euston. Lines also went to Dundee, Arbroath, Brechin and Kirriemuir. The station has been demolished and replaced by a small housing estate. However, a major locomotive shed remains and is in use for vehicle body manufacture. Some bridges and cuttings still survive but the site of the goods station, which was also the town's original railway station before the one near the county buildings was built, is now mainly residential properties. The nearest stations still open are in Dundee, Carnoustie and Arbroath, which are all around 14 miles (23 km) away. There are Stagecoach Strathtay bus services to Dundee, Arbroath, Kirriemuir, Brechin and other places. As with most of the British Isles, Forfar has an oceanic climate (Köppen: Cfb). The nearest weather station to Forfar is located around 3 miles (5 km) north of Forfar, and is 91 m (299 ft) above sea level. The town is home to senior football club Forfar Athletic, who currently play in SPFL League One and two SJFA clubs, Forfar West End, who currently play in the East Region Super League and Forfar Albion, who currently play in the East Region Premier League North. Forfar Athletic's ground, Station Park, also plays host to matches featuring Dundee United Reserves. Youth and Women's Football is also available in the town, with Forfar Boys F.C (boys only), Lochside Boys F.C (boys only) and Forfar Farmington F.C (boys, girls and women's) All the clubs have SFA Quality Mark Award at some level. Rugby Union is represented in the town by Strathmore Rugby Football Club, who play their home games at Inchmacoble Park, beside Forfar Loch. Strathmore Cricket Club, founded in 1862, has played at Lochside Park since 1873. Forfar Loch is home to Forfar Sailing Club. The town has a swimming pool and a separate dedicated leisure centre. It also has an ice rink which was built in the early 1990s and this is home to the local curling club. There are also many bowling clubs, and the Forfar Golf Club which is situated at Cunninghill to the east of the town. Angus Gliding Club operates at Roundyhill, between Glamis and Kirriemuir. It also has a newly built skatepark which is near the town's leisure centre. Coureen Peters & Elaine Gallon (Acting). Strathmore Primary School in St James' Road. The head teacher is Jennifer Garnes. Langlands Primary School in Glamis Road. The school reopened in May 2009 after the original buildings were demolished and an extensive period of rebuilding and landscaping. The head teacher is Karen Tough. Forfar Academy Taylor Street, one of the largest schools in Angus with a roll of around 1,200 pupils. Chapelpark Primary School on Academy Street (the former Forfar Academy) was closed in 2007 and pupils were re-located to Strathmore Primary and Whitehills Primary. The building continued in use as a school, initially by Whitehills Primary until their new school was completed in early 2008. It was then home to Langlands Primary, until the new school on that site was completed in May 2009. Some locals believe it would have made a great library/museum, but in spring of 2016 it was decided that it would be turned into an apartment block, it was completed in the summer of 2018. Kirkriggs Primary School in St. James' Road was closed in 2007. Pupils were re-located to Langlands until the new school on this site (Strathmore Primary) was completed in early 2008. Wellbrae Primary School closed in 2007. Pupils were sent to Chapelpark Primary School and later to Whitehills Primary School. The play areas of Wellbrae were all concrete. In 2016, it burned to the ground in an arson attack. The local community hospital, the Whitehills Health and Community Care Centre, was built on the site of the old Whitehills Hospital building (the former hospital for infectious diseases) and opened in Spring 2005. The new hospital replaced Forfar Infirmary, formerly the town's main hospital, as well as Whitehills Hospital. The Infirmary has since been completely demolished, and the site sold off to developers. The Fyfe-Jamieson maternity hospital closed some time ago; it was across the road from the Forfar Academy, but the site has since been built over with houses. East and Old Church, originally the parish kirk, with a tall slender spire, with steeple clock overlooking the town centre. It is a category B listed building and was refurbished in early 2017. The church is situated in the town centre and offers a mixture of traditional and contemporary worship. Lowson Memorial Church, off Montrose Road. This is a category A listed church in late Scots Gothic style built in 1914 by A Marshall Mackenzie, who also designed Crathie Kirk. The church contains notable stained glass windows by Douglas Strachan. The church serves the east side of Forfar, and provides a mix of traditional and contemporary styles of worship. St Margaret's Church, in the West High Street, originally a Free Kirk. It had been decided (by a Church of Scotland arbiter) that the East and Old Parish Church would close, and the congregation would be moving to St. Margaret's Church. This was brought back for discussion at Angus Presbytery due to a large vote against this decision. Now the East and Old and St Margaret's are to remain individual churches as they have always have been. The East & Old Church is built on the site of the original place of worship that some of the monks of Restenneth Priory built hundreds of years before the one today. The adjoining graveyard has famous 'residents' such as botanist George Don, quite a few scholars and a man who blamed the witches of Forfar for poisoning him after ill words were exchanged between them. 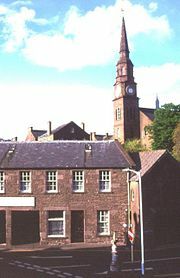 The steeple is a focal point of Forfar, visible when entering the town from any direction. Although abutting the East & Old building, it is owned by the 'Town' and is not formally part of the church property; it is all but certain to be retained following any disposal of the church building. St John the Evangelist Scottish Episcopal Church, East High Street, designed by Sir R Rowand Anderson and consecrated in 1881. Elizabeth Bowes-Lyon, later to become Queen Elizabeth the Queen Mother, was confirmed in this church. St Fergus Roman Catholic Church. Forfar Community Church at Wellbraehead on part of the old school site. The town is traditionally identified with the Forfar Bridie, a meat pastry snack popular with locals and visitors, although strictly it comes from nearby Glamis. The Forfar Bridie has been featured on many TV programmes. A recipe for the Forfar bridie was also featured in "Maw Broon's Cookbook". Another feature of the town is the Forfar Loch Country Park, which is visited by locals as a walking venue. It is said that the Forfar Loch extended over much more of Forfar in the 1800s, going as far up as Orchardbank and Wellbrae. A drainage project brought the water level down. In about the same time period the loch was used to dump raw sewage; thankfully this practice is no longer continued: it is now treated sewage. The Queen and the Duke of Edinburgh visited the town and surrounding area in 2004 (the first time in around 30 years) and again in 2011. HRH Prince Charles, the Duke of Rothesay, visited the town in April 2012 to take the salute of the Black Watch during the regiment's homecoming parade, marking its return from a six-month tour of duty in Afghanistan. The town lies in Strathmore and is situated just off the main A90 road between Perth and Aberdeen, with Dundee (the nearest city) being 13 miles (21 km) away. It is approximately 5 miles (8 km) from Glamis Castle, seat of the Bowes-Lyon family and ancestral home of Her Majesty Queen Elizabeth the Queen Mother, and where the late Princess Margaret, younger sister of Queen Elizabeth II, was born in 1930. The town is near to the Angus Glens, including Glen Doll, Glen Clova and Glen Prosen, that are popular with skiers and hill walkers. The town holds many events throughout the year such as the bi-annual Forfar Mara-Fun, which raises money for charity, and the annual Forfar Food Festival highlighting some of the local food. There is also a monthly farmers' market. Agriculture and tourism are some of the town's major industries. It also acts as an administrative centre for Angus Council, with a new multimillion-pound office complex currently on the outskirts of the town. Forfar is also home to the Strathmore Mineral Water Co., Ltd., a bottled mineral water producer now run by AG Barr. The company's products are shipped worldwide. Forfar is also known for the "coo o Forfar". A householder left a tub of beer in the doorway to cool, and a passing cow drank it. When the owner of the cow was charged for the beer, a baillie ruled that if the beer was drunk at the doorway it was "deoch an doras" or "stirrup cup", to charge for which would be an insult to Scots hospitality. This became a byword: "Be like the coo o Forfar, an tak a stannin drink". Forfar and the surrounding area is supplied with water by Scottish Water from Lintrathen and Backwater reservoirs in Glen Isla. Electricity distribution is by Scottish Hydro Electric plc, part of the Scottish and Southern Energy group. Waste management is handled by Angus Council. From June 2014, there has been a comprehensive recycling service in place, succeeding the more limited kerbside recycling scheme introduced in 2005. Recyclable waste (encompassing paper, card, cans, plastics and glass) is now collected fortnightly, on alternate weeks with non-recyclable waste, with households having separate bins for each purpose. (Garden and food waste are also collected for separate processing.) Roughly two-thirds of non-recyclable material is sent to landfill at Angus Council's site at Lochhead, Forfar and the remainder sent for incineration (with energy recovery) outside the council area. A recycling centre is located at Queenswell Road. Items accepted include, steel and aluminium cans, cardboard, paper, electrical equipment, engine oil, fridges and freezers, garden waste, gas bottles, glass, liquid food and drinks cartons, plastic bottles, plastic carrier bags, rubble, scrap metal, shoes and handbags, spectacles, textiles, tin foil, wood and yellow pages. Angus council publishes details of where and how each product is processed. There are also glass banks at the Abbeygate and Tesco car parks. The Angus Council area had a recycling rate of 34.7% in 2007/08. Healthcare is supplied in the area by NHS Tayside. The nearest hospitals with accident and emergency departments are Arbroath Infirmary and Ninewells Hospital, Dundee. Primary Health Care in Forfar is supplied by several practices, based at Ravenswood Surgery on New Road, Academy Medical Centre in Academy Street and Lour Road Group Practice. Forfar, along with the rest of Scotland is served by the Scottish Ambulance Service. As from April 2013, law enforcement is provided by Police Scotland and Forfar is served by Scottish Fire and Rescue Service. See also: Category:People from Forfar. 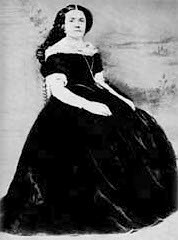 Eilley Bowers, in her time, one of the richest women in the United States, and owner of the Bowers Mansion, one of the then-largest houses in the western United States. She was a Scottish farmer's daughter who emigrated, after converting to the LDS Church as a teenager. Bon Scott, rock n' roll singer from the band AC/DC. David Taylor (1954-2014), former Joint General Secretary of UEFA and Chief Executive of the Scottish Football Association (SFA). ^ Andy Eagle. "The Online Scots Dictionary". Scots Online. ^ "Maitland Club, Edinburgh 1839" (in Latin). Lanercost Chronicle. pp. 40–41. ^ Barbour, John. The Brus. ^ "Archive Services Online Catalogue Don & Low (Holdings) Ltd". University of Dundee. Retrieved 21 August 2017. ^ "Archive Services Online Catalogue Don Brothers, Buist & Co. Ltd, Spinners and manufacturers, Dundee and Forfar, and Don & Low (Holdings) Ltd". University of Dundee. Retrieved 8 December 2014. ^ Whatley, Christopher A. (1992). Onwards from Osnaburgs: the rise & progress of a Scottish textile company, Don & Low of Forfar 1792–1992. Edinburgh: Mainstream. ISBN 1-85158-509-5. ^ "Don & Low". Don & Low. Retrieved 14 October 2011. ^ "MS 100/3 Moffat & Son Ltd, Manufacturers, Forfar". Archive Services Online Catalogue. University of Dundee. Retrieved 22 December 2017. ^ "MS 74 Craiks Limited, Linen and Jute Merchants and Manufacturers, Forfar". Archive Services Online Catalogue. University of Dundee. Retrieved 8 December 2014. ^ "MS 24/13 Forfar Fabrics Ltd". Archive Services Online Catalogue. University of Dundee. Retrieved 22 December 2017. ^ "MS 66/8 John Lowson, Jnr & Co Ltd, Jute Manufacturers, Forfar". Archives Services Online Catalogue. University of Dundee. Retrieved 22 December 2017. ^ The Jute & Canvas Trades Year-book & Directory 1946. London: British Continental Trade Press. 1946. p. 89. ^ Carstairs, A. M. (1974). The Tayside Industrial Population 1911–1951. Dundee: Abertay Historical Society. pp. 33–34. ^ "Polonica in Scotland, Forfar, Angus". ostrycharz.free-online.co.uk. Retrieved 11 June 2012. ^ "Forfar No 3 climate information". Met Office. Retrieved 1 April 2019. ^ "Forfar Farmington Football Club". ^ "Forfar Golf Club: Golf club and golf course in Angus. www.forfargolfclub.co.uk". ^ "Two boys charged over fire that gutted former primary school". STV News. 24 October 2016. Retrieved 24 October 2018. ^ "Angus Council local plan section 37" (PDF). angus.gov.uk. Archived from the original (PDF) on 7 June 2011. Retrieved 2008-09-07. ^ "Angus Council recycling centres". angus.gov.uk. Archived from the original on 7 June 2011. Retrieved 2009-08-26. ^ "Angus Council neighbourhood recycling points". angus.gov.uk. Archived from the original on 5 June 2009. Retrieved 26 August 2009. ^ "Angus Council kerbside Recycling Scheme". angus.gov.uk. Archived from the original on 7 June 2011. Retrieved 26 August 2009. ^ "Arbroath Infirmary". nhstayside.scot.nhs.uk. Retrieved 7 September 2008. ^ "Ninewells Hospital". nhstayside.scot.nhs.uk. Retrieved 7 September 2008. ^ "Ravenswood Surgery". gpsites.scot.nhs.uk. Retrieved 26 August 2009. ^ "Academy Medical Centre". gpsites.scot.nhs.uk. Retrieved 26 August 2009. ^ "Lour Road Group Practice". gpsites.scot.nhs.uk. Retrieved 26 August 2009. ^ "Scottish Ambulance Service". scottishambulance.com. Archived from the original on 19 July 2008. Retrieved 2008-09-07. Wikimedia Commons has media related to Forfar. "Forfar" . Encyclopædia Britannica (11th ed.). 1911.